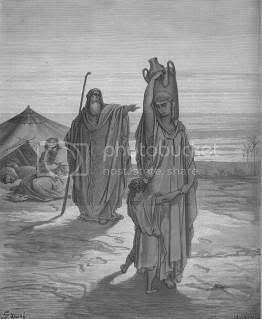 I'm over at Exemplified today, blogging about Abraham and his two boys and obedience to God. It's part of my Pentateuch Series. Stop by and check out Early The Next Morning. Speaking of early, many of you know I am, by design, an early riser. Lately, though, it's been getting harder to convince my body to pop out of bed when I used to (between 5 and 5:30). But, I do it, because I've GOTTA. If I'm not up before the kids wake up, I WON'T get my quiet time in before school, and our house will be extremely rushed to get out the door in time. But this is the LAST week of school. My daughter is done today, and my son tomorrow. I'm looking forward to being able to sleep in a LITTLE bit later. I am going to vow, however, that I will CONTINUE to wake up early, so I can continue to have my "God time" first thing before my day gets too busy. It really does make all the difference. I don't know how your schedule changes for the summer, if at all, but who wants to join me? Vow to keep God first, whether that means literally having your devotional time before anything else or something else. That's a goal worth having. Anyone? Early. Before everything. I'm with you! I need to be more diligent about this. I will have my quiet time each day, before I turn on my computer. My "alarm clock" helps—Abby, the senior cat is in my face before the crack of dawn. I think God designed her to remind me that dawn is a good time to seek God's face. Summer is in full swing over here. I completely understand. I'll let you know what I come up with; right now, I'm still shell-shocked. You're so dedicated, but I'd have to be up even earlier than you are. My little roosters are up so early, I'm not even sure God is awake. Quiet time? Right after I put the little fellows to bed. If I don't do it early, it ain't happenin! Thank YOU for the challenge. I'm with you!